A grandmother has arrived home after an epic round-the-world run she began almost five years ago. 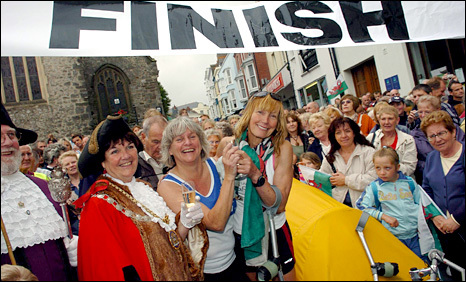 Rosie Swale Pope, 61, finished her journey on crutches after injuring her leg on the final part of her journey of more than 20,000 miles (32,000 km). 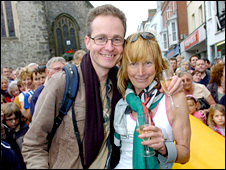 Hundreds of people lined the streets in Tenby, Pembrokeshire, to welcome her back. She set off on her 57th birthday in October 2003 to raise prostate cancer awareness after her husband's death. Clutching a glass of champagne, she said: "I'm so very moved. I can't believe you've all turned out for me. I'm just overwhelmed. "It's a journey that came out of sorrow and pain and heartache, but it's a journey that has turned to joy. I made 10,000 friends every year." Rosie has described her achievement as a "fun run that's got out of hand" but close to home her finish looked uncertain after doctors told her she had two stress fractures in her leg. She was admitted to Withybush Hospital in Haverfordwest after she found she was unable to stand on her injured leg. She said: "I'm really pleased I fractured my hip because it's made it far more exciting, and I got here just fine. "I thank the head consultant of Withybush Hospital for letting me go. I looked in his eyes and said 'I've got to do it'." Friends from as far as Alaska and Chicago were in Tenby to see Rosie finish her trip across the northern hemisphere. They included Bob Collins, a district attorney from Nome, Alaska, who helped rescue her when she got stranded in a blizzard there in November 2005. He said: "It was minus 65F and she was stuck. Many adventurous types in less severe circumstances would have given up at that point. 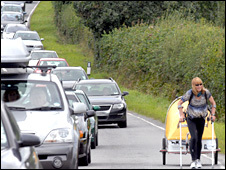 "I know local people who have attempted the route she took, but never on foot. They've told me 99.9% of people who attempt this who get stuck call it quits. "When Rosie took that next step forward, she went to a super-human level." Lee Davies, 35, from Cwmllynfell, near Swansea, said: "We've been following her blog on her website for the past five years. She has been an inspiration. "I've read Ranulph Fiennes' books, and as far as I'm concerned, she's up there with him." Rosie's son James, 37, said he was "very proud" of his mother's achievement. He said: "I'm really happy. It's a huge relief that she has successfully made it. I was worried something might go wrong. "If the stress fractures had happened up in Scotland, it would have been very difficult for her to complete the journey." Her leg injury appeared to be a minor setback compared to some of the difficulties she faced during her trek, including being hit by a bus, pneumonia, frostbite in Alaska and a breast cancer scare. She was also confronted by a man with an axe in Siberia, and knocked unconscious as she tried to cross a river. Back in Tenby, she gave three cheers for the town, and added: "I feel so humble. I've done nothing special compared to just one nurse or a doctor." Before returning to her house in the town, she said: "Thank you for the most beautiful welcome anyone could have in their life. This is a dream come true for me, and I hope everyone's dreams come true."